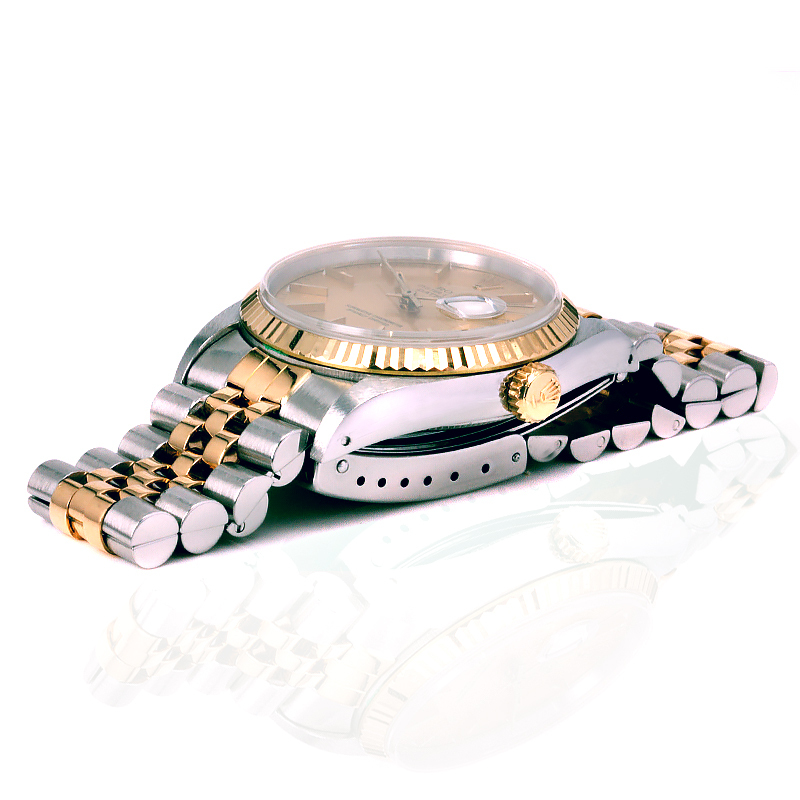 Product code: W1313cc Categories: Sold Items, Sold Rolex Watches. So easily to be worn day or night and always look perfect for the occasion, the Rolex watch case measures 36mm across plus the Rolex screw down crown and is such a practical and comfortable size to wear. With the 18ct yellow gold bezel complimenting the traditional champagne dial with indicators and date which is protected by the sapphire crystal, it is fitted on the 18ct yellow gold and stainless steel Rolex Jubilee band. Inside is the ever reliable 31 jewelled automatic Rolex calibre 3135 that keeps perfect time and comes with our twelve month warranty. The gold and steel Rolex Datejust would have to be one of the most easily recognisable and stylish watches ever produced by Rolex, and this is one that looks as good today as when it was made. 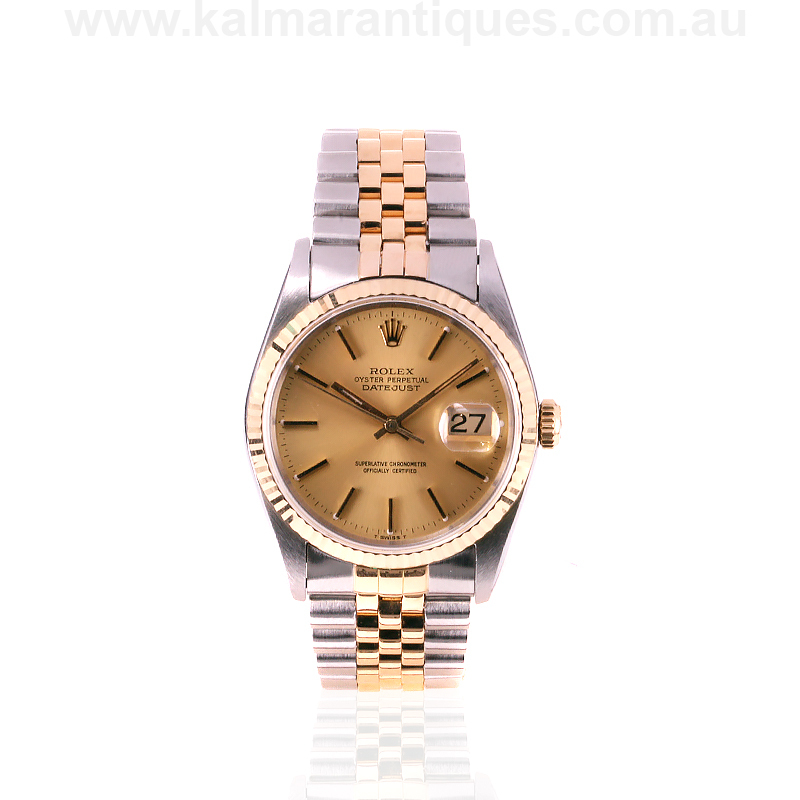 Tag: 18ct gold and steel Rolex Oyster Perpetual Datejust reference 16233. The Rolex Datejust reference 16233 is the upgraded version of the earlier Rolex Datejust reference 16013. The 16233 was now fitted with the scratch resistant sapphire crystal over the earlier models with acrylic crystal. All Rolex 16233 were in stainless steel and 18ct gold as opposed to earlier models which were in either stainless steel and 14ct gold or stainless steel and 18ct gold. Another major difference was the movement. The earlier Rolex 16013 models used the 27 jewelled Rolex calibre 3035 which was introduced in 1977 and had a power reserve of 42 Hours. The Rolex calibre 3135 which was introduced in 1988 now has 31 jewels, still a 42 hour power reserve and and Kif shock absorption. The Kif system is a Rolex invention that make the balance wheel oscillate consistently and accurately. This is not to say that the earlier Rolex 16013 were not accurate, robust or durable as there are countless Rolex 16013’s the world over on someones wrist right now that, properly maintained will continue to be a highly accurate and reliable watch for many years to come.